Independent analysis of the digital learning market recognizes LTG and Affirmity for constantly developing and delivering innovative digital learning solutions. Affirmity’s parent company, Learning Technologies Group plc (LTG), has been recognized by the 2019 Fosway 9-Grid™as a Strategic Leader in digital learning for providing a rich suite of capabilities and features to meet the needs of complex enterprise-scale organizations. Fosway 9-Grid™ is a model developed by Europe’s top HR industry analyst, Fosway Group, for organizations to compare and understand different solutions and providers in a selected market segment. The independent analysis of the digital learning market identified LTG as a Strategic Leader for constantly developing and delivering innovative solutions to meet the needs of global organizations. LTG is the publicly listed parent company of a dynamic and growing group of specialized learning technology and talent management businesses, including LEO Learning, gomo, Eukleia, PRELOADED, Rustici Software, PeopleFluent, Watershed, VectorVMS and Affirmity. 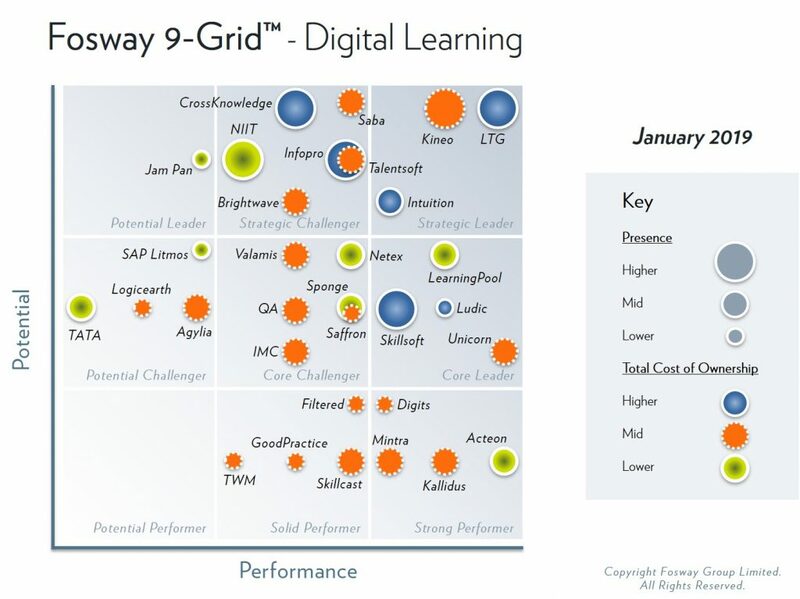 Learning Technologies Group features in the highest-ranked position on the 2019 Fosway 9-Grid for Digital Learning. Fosway 9-Grid™ is based on Fosway Group’s independent research in the HR, talent and learning market throughout the past 20 years, and draws on insight and experience of its Corporate Research Network. The Corporate Research Network is a group of HR and learning professionals, who among them represent more than 150 of Europe’s leading companies. The Fosway 9-Grid™ for Digital Learning can be accessed here. Affirmity along with sister companies, LEO Learning, gomo and PeopleFluent, will be at Learning Technologies 2019 in London, February 13-14, and available at stand F10. Affirmity, a former division of PeopleFluent, provides expert analysis, consulting, training, and software to optimize affirmative action and diversity and inclusion programs. Our team of experts delivers diversity metrics and data-driven insights to manage and mitigate risk. Drawing on more than 40 years of experience, we guide HR and compliance teams through diversity goal setting. Affirmity empowers leaders with tools and dashboards to measure progress, and we help clients capture and communicate the positive business impacts of diversity initiatives. A part of Learning Technologies Group plc (LTG), Affirmity serves more than 1,100 organizations—including global corporations, mid-sized organizations, and small businesses. Learning Technologies Group is a leader in the high-growth workplace learning and talent industry. The Group offers end-to-end learning and talent management solutions ranging from strategic consultancy, through a range of content and platform solutions to analytical insights that enable corporate and government clients to meet their performance objectives. LTG’s businesses—LEO Learning, gomo, Eukleia, PRELOADED, Rustici Software, PeopleFluent, Affirmity, Watershed, and VectorVMS—are at the forefront of innovation and best-practice in the learning technology and talent management sectors, and have received numerous awards for their exceptional performance. Our portfolio of brands represents the best of breed and they are acknowledged throughout the industry as market leaders.